Maoism is not confined to the jungles of India and the Philippines, or the mountains regions of Peru and Nepal. Maoism has a long history in Australia, particularly in Melbourne, where the ultra secretive Communist Party of Australia-Marxist-Leninist, maintains its headquarters. Long past its heyday, Australian Maoism and the CPA-ML may be about to experience something of a revival. In June, an international Maoist umbrella organisation established an Australian branch, to be led by well known Melbourne unionist and one time Telstra Board contender, Len Cooper. 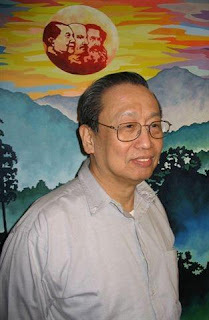 The International League of Peoples Struggles is based in Utrecht, Holland and is led by long time leader of the Communist Party of the Philippines, Jose Maria Sison. The IPLS links well over 200 Maoist organisations from the US, Europe, Asia, Latin America, the Philippines, New Zealand and now Australia. We, in the International Coordinating Committee, express to all of you warmest greetings of solidarity. We acknowledge the original custodians of your land, the Australian Aboriginal People. We are elated to know that various organizations are forming the Australian national chapter of the International League of Peoples' Struggle (ILPS). We congratulate the Initiating Committee led by Len Cooper, member of the ILPS International Coordinating Committee, Migrante-Australia, Communications, Electrical and Plumbing Union of Australia [CEPU] - Telecommunications Branch (Victoria), Migrante-Melbourne, Spirit of Eureka Committee, Bolivarian Circle and others for successfully preparing and convening this assembly. The formation of the ILPS-Australia is highly important. You are committed to carry out an anti-imperialist and democratic struggle on as many as 18 concerns, as stipulated in the ILPS charter. You have your own national chapter constitution and you are building an alliance of organizations in order to be able to achieve far more than you could if you remained separate organizations. We hope that the formation of ILPS-Australia will contribute to the advance of the anti-imperialist and democratic struggle in Australia, Oceania, Asia-Pacific region and in the entire world. So long as we fight for a just cause and rely on the people, we can hope and look forward to a bright future of national and social liberation, development, social justice and world peace. Long live the ILPS-Australia national chapter! Onward with the anti-imperialist and democratic struggle in Australia! Long live the International League of Peoples" Struggle! Len Cooper has a long history of leftist activity. Some family members were active China supporters in the old Communist Party of Australia. Many of Cooper's associates have been linked to the CPA-ML, a pro Chinese breakaway from the CPA. Certainly, the CPA-ML's newspaper Vanguard has given Cooper's new organisation favourable coverage. The twenty or so participating organisations represented only a fraction of the active people’s organisations, community groups, trade unions and other issue groups currently engaged in multiple struggles to defend people’s rights, to secure decent jobs, wages and conditions, to protect and repair the natural environment, to oppose imperialist war and exploitation, and many other campaigns. Nevertheless, there was great confidence that ILPS Australia would be able to play an important role in promoting, supporting and assisting on-going struggles, as well as providing expression for anti-imperialist ideas and analysis. In this way the organisation could extend its influence and win wider respect and support over time. The first activity of ILPS Australia will be a public forum in Melbourne on 31 August and 1 September, to counter an APEC meeting planned for Sydney later that month.